Jessica Hynes appears as part of a star-studded line up for new BBC quiz special We Love Sitcom this Friday evening. A sort of ‘Big Fat Quiz of the Sitcom’, this hour long special features Ben Miller as quizmaster, alongside four teams of comedy greats, battling it out to be crowned quiz champions. Rounds include Name That Theme Tune, Guess the Unsung Sitcom Star and Mime It Like Mr Bean, which we really can’t wait to see! Joining Hynes – whose sitcom credits include Spaced, Up The Women and The Royle Family – is The Thick of It star Chris Addison. 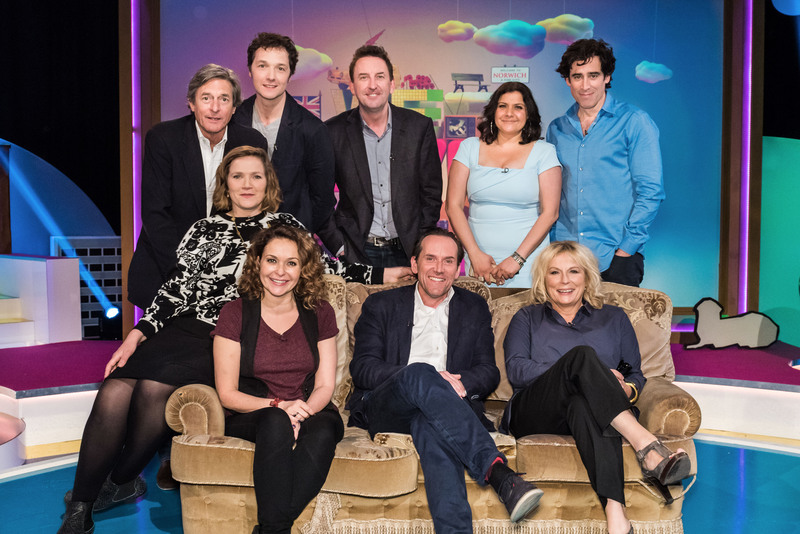 They’re up against the the legendary Jennifer Saunders and her Ab Fab on-screen daughter Julia Sawalha; Green Wing‘s Stephen Mangan and Goodness Gracious Me‘s Nina Wadia; and two actors with TVO connections – Not Going Out‘s Lee Mack and Brian Pern regular Nigel Havers. Car crash! The first question came 10 minutes after the start of a long and tedious bout of waffle between those taking part.I have seen better organised pub quizzes!In short an insult to the programmes that they were there to answer questions on.